The last plan dates back to 2003, and much has changed in Houston since then. The plan gave us the existing rail lines, except for the University Line, which has now lost any form of federal funding that was once available. Patman said that it is time to start a new plan, likely asking for bonding authority to pay for future improvements, possibly specifying routes or modes of transit. As Houston continues to grow, it’s inevitable that there will need to be increased opportunities for transit, not simply adding highway lanes. In her most recent Houston Matters interview Patman noted that change sometimes brings unintended consequences, which METRO has experienced in select areas with respect to the New Bus Network. Selected bus routes were changed, especially in low ridership areas, leaving some riders without bus options. this is especially difficult because many of those left without bus options rely on the bus for transit. Patman assured that the agency will not leave out those that are without bus service. I think that’s a tough promise to keep as many parts of METRO’s service area may not justify a route that transports a small number of riders. As seen with the New Bus Network, there is a balance for the agency in providing coverage compared to frequency. Without adding additional resources, likely at a cost, greater frequency (which is probably the more important of the two to many riders) cannot happen. METRO has been using their Community Connector service in Acres Homes, with fair ridership according to METRO staff. The Community Connector acts as an “on-demand” service within a particular zone to provide connectivity between major destinations and the Acres Homes Transit Center. This program was compared to Helsinki, Finland’s now-defunct Kutsuplus program, which acted somewhat as an Uber Pool-type program. Aimed at decreasing the need for private cars and providing a connection between many of Helsinki’s north-south oriented bus lines, the program was initially successful, then came to an abrupt end at the end of 2015. The program needed a larger scale in order to be more profitable, and the cost of doing so would have been heavily supplemented by taxpayers. It’s important to remember that this is a method for supplementing trips in areas that may not warrant as many frequent bus routes. Patman’s final major goal was the continuation of improving the ridership experience on METRO’s bus and rail lines, as well as marketing the system to new users. Andrews notes my post on how Metro might market itself, then goes on to make his own suggestions. There are themes from my other posts as well. Patman specifically said that she reads what those of us who were there have to say about Metro and what it is (and should be) doing. My reaction after that meeting is that they’ve already got this figured out, and are doing or at least studying plenty of the things all of us had in mind. It’s encouraging to see, and again I urge you to read Andrews’ report as well as the one that was posted on the Metro blog. I still have a post to write about where things are and where they may go with rail, but I’m still thinking about it. In the meantime, there were some more tweaks applied to the new bus network. You can see all the changes here. As the KUHF story notes, there will be more to come, with a new Manchester/Lawndale route to the Magnolia Transit Center set to debut in July. I promise to have my rail post done before then. Not a surprise at this point. A proposal for a light rail line along Richmond Avenue, long left for dead because of strong opposition and years of languishing, has lost its shot now for funding from the Federal Transit Administration. Culberson, a long-time opponent of the line proposed in his west Houston district because it runs along Richmond, applauded the decision. “My primary responsibilities as a congressman include protecting the taxpayers and protecting the quality of life in our neighborhoods,” Culberson said in a statement. The effect is limited, however, because the University Line plan had been bogged down for years, and could be revived at any time should Metropolitan Transit Authority restart the process and gain voter approval for more transit funding. Metro officials received notice of the funding recision earlier this month, spokesman Jerome Gray said. “I am not sure it does anything with the project because the project was dormant,” Metro chairwoman Carrin Patman said. Culberson and Metro officials last year came to an agreement that any further rail development using federal funds in the Houston region first will go back to the voters. If Metro receives approval and the local money needed, transit officials could go back to Washington looking for funding. Patman, who took over as Metro chairwoman last month, said inaction on the University Line should not be construed as the end of a broader discussion about better transit in Montrose and along U.S. 59. See here, here, here, and here for the background on the Culberson/Metro peace accord, which was announced just over a year ago. Because of the terms of that agreement, Metro was always going to have to go back to the voters to get a Universities line going, and in fact then-Metro Chair Gilbert Garcia, who negotiated the treaty with Culberson, was already talking about a sequel to the 2003 rail referendum. New Chair Carrin Patman has also spoken of a need to go back to the voters for more bonding authority. If I had to guess, such a vote is a couple of years out, almost certainly after Mayor Turner has had one to repeal or modify the revenue cap. When that happens, if it passes, Metro will have to start from scratch, including the designation of an actual route, but given how old the existing work was by now, that’s probably for the best anyway. I choose not to cry over spilled milk but to work for a better outcome next time. The original Universities line route had shifted over to Westpark at Timmins, so the line was on Westpark at this point, and there would likely have been a stop at Newcastle. (My in-laws live near there, so I’m quite familiar with this area.) Notice all the apartments west of Newcastle and south of Westpark, as well as the HCC campus. Those would all be easily accessible from a train station at Westpark and Newcastle, except for one tiny thing: There’s no sidewalk on Newcastle south of Westpark. Any pedestrians would have to walk in the street, which is a two-lanes-each-way thoroughfare, or on the grass. Once you cross into the city of Bellaire, just south of Glenmont Drive, there’s a beautiful, wide sidewalk that’s basically a hike-and-bike trail that goes all the way to Braeswood, but until you get there you’re on your own if you’re on your feet. What you could do is move the fence back ten feet or so on the empty lot on the south side of Newcastle – I suspect this is Centerpoint property; the lot on the north side of Newcastle has power grid equipment on it – and build a nice sidewalk there to at least get you to Pin Oak Park, which has its own sidewalks and can get you to the other places from there. The Westmore apartment complex between Pin Oak Park and Glenmont fronts on the street so you’d have to close off a lane on Newcastle to extend this hypothetical sidewalk further, but it’s not like this is a heavily-trafficked section of road. It’s all doable if one has eminent domain power and a reason to take action. If we’re going to talk about near-future rail referenda and Universities Line 2.0, I hope someone other than me is thinking about this sort of thing as well. Second, Congressman Culberson will begin work right away to change federal law so that METRO can use all of the federal dollars not yet drawn down from the $900 million in previously approved federal transit grants for corridor specific transit projects, particularly the new North and Southeast rail lines as well as the 90A commuter rail line. These proposed changes will be consistent with the goals of the FTA in order to allow METRO to match these funds with credits from the original Main Street Line or other Transportation Development Credits so that local funds will be freed up for new projects to improve mobility in the Houston area. Third, Congressman Culberson will begin work right away to change federal law so that METRO can count $587 Million in local funds spent on the East End Rail Line as the local matching credit for a commuter rail line along 90A, and secondarily for any non-rail capital project, or any other project included in the 2003 Referendum. Rail on Richmond Avenue west of Shepherd Drive or Post Oak Boulevard would only be eligible to utilize these credits once approved in a subsequent referendum. Fourth, Congressman Culberson will begin work right away to help secure up to $100 million in federal funds for three consecutive years for bus purchases, park and ride expansion and HOV lane improvements. These funds will also facilitate METRO’s expanded use of the 2012 referendum increment to pay down debt. All of these efforts will enhance and improve the bus system that is already one of the best in the nation. Anyone know if any of these things are happening or have happened? I would hate to think that Congressman Culberson has not kept his word. An update on these items would be nice to hear. Houston’s buses don’t run at 2 a.m., but that’s when Metro and U.S. Rep. John Culberson began to see real movement toward a deal to improve area transit service. “We got really intense one night and literally worked line-by-line,” Metropolitan Transit Authority chairman Gilbert Garcia said last week, explaining how months of on-and-off talks helped Metro leaders and Culberson overcome years of distrust and division. “There was a point where the congressman said, ‘Gilbert, we’re there,’ ” Garcia recalled. Culberson, a Republican, credited Garcia with breaking through a long history of distrust by acknowledging errors in previous Metro plans and focusing on areas where transit officials and suburban politicians could find agreement. Last week, Garcia and Culberson inked a deal that puts aside the bitter fight over rail along Richmond Avenue. The agreement delays that issue until after voters get a chance to weigh in, which could be years from now, and instead identifies other projects Culberson can help the transit agency bring to fruition. Both said they feel confident about this deal. In the past, Culberson and transit officials have spoken of cooperation, only to resume lobbing rhetorical bombs at one another a few months later. “It’s in writing,” Culberson said of the new agreement. The deal, described by Garcia as Metro’s “grand bargain” with one of its staunchest critics, is hailed by both sides as a big win- a clear delineation of what each will do for the other. The cessation of hostilities gives Houston a chance to secure federal funding for projects caught in the crossfire of Culberson’s refusal to open a door for a Richmond Avenue light rail project and Metro’s attempts to make the Richmond line the region’s next signature rail project. Much of this is stuff we already know, especially if you listened to my interview with Gilbert Garcia and/or Houston Matters’ interview with Culberson. There is of course the question of whether you believe this is for real or not – the Chron expressed a fair bit of skepticism in a recent editorial – but as I said, this is how it is with every contractual agreement ever. Either you believe the other side will do as they say or you don’t. The one piece of new-to-me information in the Chron story was the involvement, on Metro’s behalf, of Republican lobbyist and former Rick Perry chief of staff Mike Toomey. I don’t know what to say about that except that politics really does make for strange bedfellows, and lobbyists really are like roaches in the sense that they’re everywhere whether you can see them or not. For now, I hope the next thing to say about any of this is to hail the news of funding being secured for each of those projects that the agreement touched on. While people in the rural counties are trying to kill the proposed high speed rail line between Houston and Dallas, some other people here in Houston are thinking about where a station should be. [Lynn] Hardwin was among a few dozen people attending an open house held by Texas Central Partners on April 23 at the venerable Tin Hall dance hall, situated on a quiet 40 acres in Cypress since 1890. TCP is the development arm of the project and would own and operate the rail service. Members of Houston High Speed Rail Watch, a coalition of central Houston neighborhoods that includes Super Neighborhoods 12, 22 and 51 as well as other groups, also attended the event, which focused on dispelling misconceptions that have erupted since the Federal Railroad Administration and Texas Department of Transportation began an environmental review process of the privately-funded project last summer. It will be months before new details emerge about the proposed rail’s exact route and where it might terminate in Houston. From 290 and Loop 610, TCP is eyeing an alignment on Interstate 10 into downtown, but Union Pacific lines in the Washington Avenue area have been considered, too. The coalition is advocating a path that avoids residential neighborhoods, says spokesman Mark Klein, who is president of Super Neighborhood 12 along the North Loop east of U.S. 290. The group argues that only a small percentage of Houston residents will use the new rail service – not enough to justify the potential impact to well-established neighborhoods located in its path to the Central Business District downtown. “We envision a rail terminus located northwest of the 610 Loop, such as at the Northwest Mall, or routing the line to a downtown terminus along freeways or through industrial areas,” Klein said. Details about the exact route and how much property will be needed outside of existing rail or other public rights-of-way won’t be known until the draft environmental impact statement is completed, by early 2016. Two station locations are being eyed in Dallas, but TCP has not settled on a Houston station location. While it hopes to put a station downtown, officials say the line could terminate elsewhere. Jersey Village might be another option for a station location, says City Manager Mike Castro, who also attended the Cypress open house. The city created a transit-oriented development district on U.S. 290 at Jones Road in its master plan in anticipation of commuter rail a few years ago, Castro said, adding that the zone could accommodate a station for the high-speed rail service, too. See here, here, and here for some background. The original idea was to have the high speed rail line come into downtown, since that is likely to be a common destination for business travelers and it’s also well connected to other transit options. That means routing the line through residential neighborhoods, which is a big problem if you’ve got these elevated tracks. Having the terminal be farther out, such as at the Northwest Transit Center, solves these problems but creates others, since an isolated terminal is less useful to someone who doesn’t want to have to park at it or doesn’t want to rent a car. Having the Uptown Line in place would help with that, and having the Uptown Line plus at least one other line that connects to it – the Universities Line and/or an Inner Katy Line – would help a lot more. Maybe Metro’s peace treaty with John Culberson can help make these things happen. Who knows? There are a lot of moving parts and a lot of possibilities here, some more promising than others. We’ll know more as the environmental impact statement process concludes. We’ve all had a chance to read over and digest the agreement Metro struck with Rep. John Culberson now. It looked good to me up front (though not to everyone – more on that in a bit), but as always with something this involved, there are many questions. What do some of these items mean, and when might we start to see some of the effects of this deal? I had much to ask, and Metro board Chair Gilbert Garcia had the answers. He took a few minutes to talk to me and address my queries. Here’s what we talked about. What has been the hook in Culberson’s jaw to make him come to the table and put out this grandiose agreement with Gilbert Garcia? In my estimation, that hook can only be coming from elements in his district wanting clarity on the rail-on-Richmond/Post Oak issue. Afton Oaks once again, for better or for worse, dictates to the rest of METRO’s service area its light-rail policy. Wanting clarity on the Richmond/Post Oak rail issue makes Culberson’s agreement this week not so surprising. He simply wants new votes, and I don’t much blame him for that. What this agreement does, I think, is codify, though not in law, a broad regional strategy for public transport as well as lay a foundation for future regional inter-government cooperation. More importantly, the fast-tracking of the METRO Board composition change takes away from a future rogue Mayor of Houston the ability to completely stymie the process of mass-transit improvement, as Mayors Holcombe, Lanier, and White did with such effect. It also gives a new perspective on Houston Mayor Lee Brown’s work in the late 1990s to bring light rail to our city. However, this work also set a precedent for light rail that is at-grade and stops for red lights, the wisdom of which is to my mind still to be proven. My friend, Wayne Ashley, in his blog is far-more effusive about this ‘Culberson-Garcia Accord’ than I. Culberson could still be forced to go back on his word, and this year’s election for Mayor of Houston could produce a maverick with his own ideas about Houston mass-transit which include not so much cooperation with the County and Multi-Cities, which for Houston-area bus riders will not be a good thing. Yes, I am very guarded about all of this. I would note, as Chair Garcia did in our conversation, that Metro was already prohibited by law from using any federal money on the Universities Line as currently designed. This agreement allows for a way forward, which we didn’t have before. Of course it requires Rep. Culberson to keep his word, but then that’s true of any contract. Metro has an end to hold up, too. Sure, a rogue Houston Mayor could undo or undermine a lot of this, but it has always been the case that a non-transit-oriented Mayor could do a lot of damage. That’s why I’ve been so obsessed with where the Mayoral candidates stand on mobility and transit and other issues. We need to know these things, and we need to not be satisfied with platitudes and evasions. We also need to not be satisfied with any Mayor that isn’t fully on board with taking advantage of this great opportunity Houston has been given. We have been presented with a great opportunity. Let’s grab it with both hands and run with it. UPDATE: You should also listen to this Houston Matters segment about the agreement, in which Craig Cohen speaks to Rep. Culberson and a couple of media types. Culberson is still spewing the same untruths about the 2003 referendum, and pointedly said that while he would not obstruct future rail construction if the voters approved it he would absolutely oppose such a referendum. So yes, one should maintain one’s level of skepticism. One correction to something Bob Stein said after Culberson was on: The 2012 referendum forbids Metro from spending the extra money they would get from the sales tax from scaling back the 25% give back on rail. They’re not restricted on spending other money on rail. I’ll agree they don’t have it to spend, at least in the absence of new federal funds, but the 2012 referendum isn’t the cause of that. Gotta say, this all sounds pretty good. 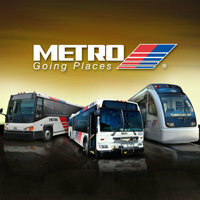 First, Congressman Culberson supports METRO’s proposed legislation pending in the State Legislature that expands the size of the METRO Board, increases the eligible length of Board member service and allows the existing board to elect a chairman in October with an odd initial term. These changes will help ensure better regional cooperation in designing and building successful transportation projects while smoothing the transition from the current board size to the larger board size that current law will require in the near future. Fifth, METRO wants to eliminate confusion for property and business owners on Richmond Avenue west of Shepherd Drive and on Post Oak Boulevard. Therefore, the METRO Board will adopt a resolution pledging not to use any federal or state funds to build rail on Richmond Avenue west of Shepherd Drive or on Post Oak Boulevard north of Richmond unless METRO service area voters approve it as part of a future METRO service area referendum. Likewise, no local funds can be spent on such a rail project without a referendum except expenditures of local funds necessary for the proper studies and engineering to present to the voters in the required referendum. Any such referendum will be part of a multi-modal transportation plan including reasonable cost estimates and a description of the project’s pathway and end points, realizing that pathways could undergo minor adjustments as a result of unforeseen environmental problems. Sixth, Congressman Culberson will begin work right away to memorialize this agreement in both federal and state law. Thus, METRO does not oppose Congressman Culberson’s language amending Section 164 of the FY16 THUD appropriations bill to memorialize this agreement. And, Metro does not oppose his efforts to memorialize this agreement in state law. Seventh, if METRO service area voters approve the referendum, Congressman Culberson pledges to support the will of the voters and he will work to secure the maximum level of federal funding available for the transit projects described in the referendum. All of that is from a “letter to our fellow Houston area citizens” signed by Rep. Culberson and Metro board Chair Gilbert Garcia, which you can see here, following an announcement on Friday that the two had reached an accord. It’s about everything I could have wanted – getting the US90A extension moving, providing a path forward for the Universities line, and more. I don’t know how Metro accomplished this, but wow. Major kudos all around. I’m sure there will be more to come, and I am eager to hear it. The later version of the Chron story adds a few details, and Texas Leftist has more. Metro and U.S. Rep. John Culberson have called a truce in their war over a planned light rail line on Richmond Avenue, suggesting an end to an impasse that has stymied local transit development. Culberson, a Republican from Houston, has stood in the way of the Metropolitan Transit Authority’s federal funding efforts for years. While the new agreement does not necessarily mean the Richmond line will be developed, it could help Metro move forward with other transit projects. “We have got to make progress or we are in gridlock,” Metro Chairman Gilbert Garcia said. The announcement follows months of discussions and comes days before Metro is set to open two new rail lines serving east and southeast Houston. The Green and Purple lines open May 23, the next step in development of a light rail system that has divided Metro and many critics, notably Culberson, since voters approved it in 2003. From his seat on the House Appropriations Committee, Culberson has stopped Metro from receiving any Federal Transit Administration funds related to rail on Richmond or a similar rail plan along Post Oak, later converted to a fixed-route bus system. Culberson represents voters west of Shepherd along Richmond, many of whom vigorously oppose the rail line. Just as a reminder, while the anti-rail faction is highly vocal, there’s little evidence to suggest they’re any kind of majority. Precinct analysis from the 2006 election, when funding for the Universities line and the debate about whether or not it belonged on Richmond Avenue were hot items, suggests that Culberson and then-State Rep. Martha Wong did not gain any votes by being anti-rail, and may have lost some votes for it. That was a long time ago and 2006 was an oddball election, so I wouldn’t stake too much on any of that, but it always annoys me to see these loudmouths presented as the prevailing opinion. Recently, Culberson announced he would seek to continue cutting off the Richmond money in the next federal funding bill, but he softened his stance by saying Metro could seek money for the lines if they receive local voter support in a new election. He said current leaders have made the agency more financially transparent, helping him to find common ground with them. “I am especially pleased that our agreed-upon amendment today will make Metro the first transit agency in America to require voter approval of a very detailed and very specific transportation plan before they can move forward with construction,” Culberson said in a statement. The change in tone drew praise from Rep. Ted Poe, another Houston-area Republican, who sparred with Culberson over his blocking the federal funding for rail along Richmond. 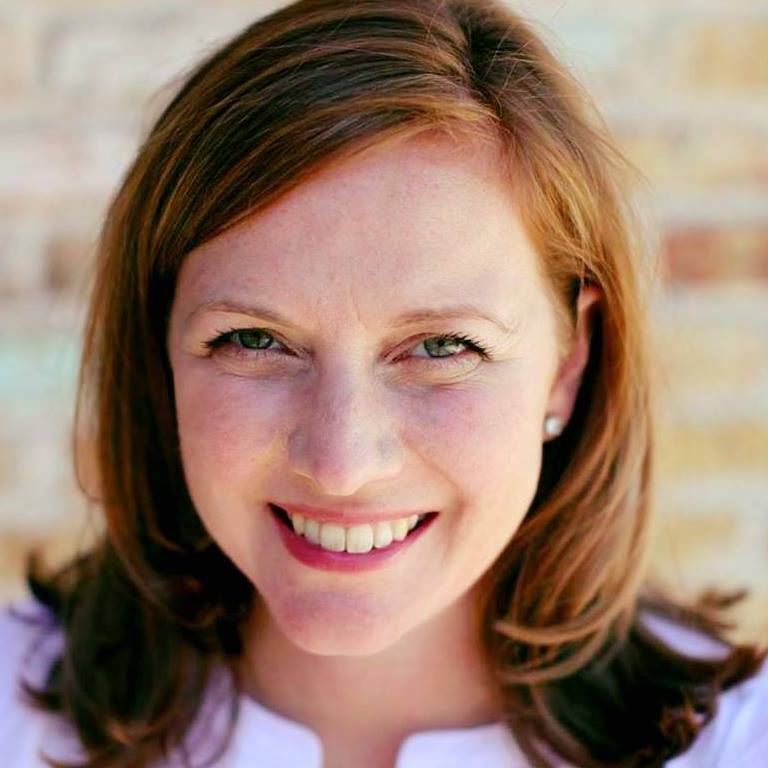 “While we would prefer to have no limiting language, this compromise allows the voters of Houston to have a voice in this matter, which has been Congressman Poe’s concern the whole time,” said spokeswoman Shaylyn Hynes. We’ll have to wait and see exactly what this means, but if we can settle this matter once and for all and get the ball rolling on the US90A rail extension into Fort Bend County, that would be a big step forward. The fact is that sooner or later, we’re going to need the Universities line and we’re going to want to build it. It doesn’t make sense to have the Uptown line as an island unto itself. The system as a whole will be far more valuable if it is all connected. 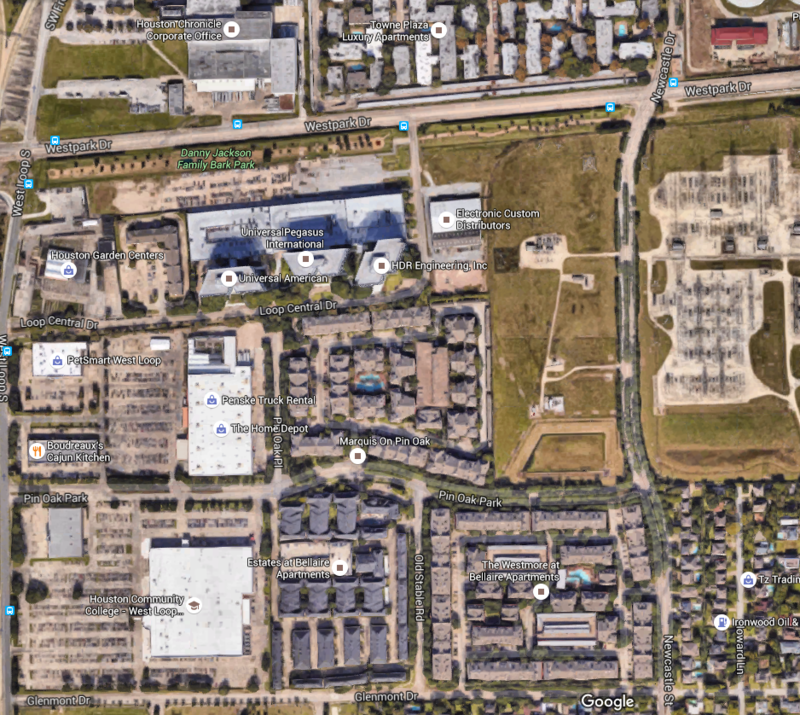 If we do wind up with the high speed rail line terminal being out at the Northwest Transit Center, that makes connections to the Uptown Line (including perhaps an Inner Katy line, which by the way was also part of the 2003 referendum) all the more necessary. All I ask is that if we have to re-vote on the Universities line that we get full cooperation from our entire Congressional delegation if it passes as well as the possibility of building on what we already have. It doesn’t have to happen right away, it just has to happen. Houston Tomorrow and Texas Leftist have more. 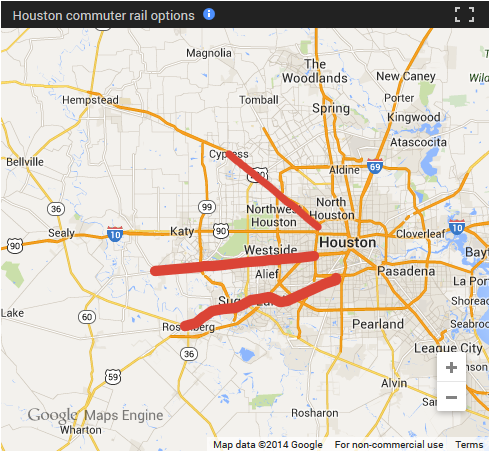 There’s still a push for commuter rail in Houston. With freight trains on Houston area tracks teeming with cargo, supporters of commuter rail to the suburbs are focusing on three spots where they can potentially build their own lines for passengers. The Gulf Coast Rail District – created in part to find a way to make commuter rail work in Houston – is studying three possible routes for large passenger trains. What’s clear, at least for the near future, is that commuter trains will not share any track with local freight railroads, or buy any of their land. Without access to the freight lines, Crocker said, commuter rail must find its own way. Focusing on land owned by local governments or the state, and near current freight lines, officials identified three possible routes for study: along U.S. 290, U.S. 90A and the Westpark corridor. The plan is to further study all three, looking at how much ridership they could expect while analyzing the type of property that would have to be purchased, engineering challenges and costly factors such as bridges. Each of the routes includes some easily obtainable land and could connect suburban commuters to the city. The goal would be to develop commuter rail from the suburbs to Loop 610 – or farther into the central city under some scenarios – and connect it to local transit. Both the Westpark corridor and U.S. 290 offer close access from western or northwestern suburbs to The Galleria and Uptown areas, where a single bus or light rail trip could carry travelers from a train station to their final destination. The U.S. 90A corridor, which Metro has studied before, offers access from the southwest to the Texas Medical Center. Developing rail along any of the corridors would pose many challenges. In the case of the Westpark and U.S. 290 routes, both would abut local roads, meaning ramps and entrances would have to undergo serious changes. Other projects, such as light rail and toll roads, also are being considered for the space. The terrain poses challenges as well. A U.S. 90A commuter rail system would need to cross the Brazos River and would pass by the southern tip of Sugar Land Regional Airport. To me, US90A is the clear first choice. I’ve been advocating for Metro to turn its attention back to what it calls the US90A Southwest Rail Corridor (SWRC). As recently as two years ago, they were holding open houses to get community support and finish up a Draft Environmental Impact Statement (DEIS), which would put them and that project in the queue for federal funds. Unfortunately, as of September of 2012, the plans are on hold. I would hope it wouldn’t be too difficult to revive that process, in partnership with the GCRD. Note that while Metro’s original plan for the SWRC stopped at Missouri City, just across the Fort Bend County line, while the GCRD plan goes all the way to Rosenberg. The latter would clearly have much greater ridership potential, and would include destinations that would be of interest outside the regular commute, such as the airport and Skeeters Field. You only get to do this sort of thing right the first time, so it would be best to plan to maximize ridership from the beginning. As for the other two, it must be noted that the corridors in question are already fairly well served by Metro park and ride. There’s some overlap with the US90A corridor, but not as much. Both Westpark and US90A continue well into Fort Bend County and thus beyond Metro’s existing service area, so I suppose the Westpark corridor would be the next best choice for commuter rail. The other key factor at play here is that the US90A line would connect up with the existing Main Street Line, thus potentially carrying people all the way from Rosenberg and elsewhere in Fort Bend to the Medical Center, downtown, and beyond. The 290 corridor will at least have the Uptown BRT line available to it as a connection, and if it were to happen it might revive discussion of the Inner Katy Line for a seamless trip into downtown via Washington Avenue. As for Westpark, well, go tell it to John Culberson. You know what we’d need to make any Westpark commuter rail line the best it could be. Anything the GCRD can do about that would be good for all of us. It’s useful to compare, but mostly as an academic exercise. The new Dallas Area Rapid Transit line links riders to the region’s major airport. Houston’s new Purple and Green lines, years in the making, come up far short of what’s been laid in the Dallas area, but they open up rail to new parts of town. Since 1983, and some argue even longer than that, the cities have been on vastly different trajectories when it comes to rail transit. Dallas has enjoyed a much less fractious political climate. That relative calm compared to Houston has given Dallas officials more latitude to invest and leverage local money to capture federal funds. Officials in North Texas spent money on suburban routes rather than key urban connections. DART will soon have 90 miles serving 62 stations, while Houston later this year will have 22 miles of track and 38 major stops. Houston’s population is twice that of Dallas, though their respective metropolitan areas are similar in size. Metropolitan Transit Authority officials decline to call the light rail lines competitors. But from time to time, as a sales pitch for more tracks, they compare DART’s apparent ease of laying lines to Houston’s perennial controversy. The race for more lines isn’t much of a competition because many Gulf Coast area elected leaders don’t want rail, or more specifically they don’t want to spend the hundreds of millions of dollars associated with trains. As a result, Houston has taken a different tack, choosing politically palatable downtown city lines that in some respects are harder to build but carry many more riders per mile. Which system is more successful, and which will be better off in the long run, is less clear. I’ve sat on this one for awhile as I’ve gone through several revisions in my head of what I’ve wanted to say. I agree with the story’s premise that Dallas and Houston each took the most viable path available to them given the resources and needs they had. We’ve had plenty of arguments in Houston about whether commuter rail should have been prioritized over light rail. To me it’s ultimately a chicken-or-egg question, but to me the fact that we already have a muscular park-and-ride network that covers much of the ground that commuter rail would plus the fact that mobility in town keeps getting worse with nothing other than light rail available to help mitigate it tips the scales. Commuter rail has a place and if we can make like Dallas and leverage some existing tracks to do it at a low cost, I’m all over it. Just remember that the value of a rail network increases greatly as the network grows, so commuter rail + a robust light rail system > commuter rail by itself. One of the things I’ve been thinking about since Metro announced the reimagined bus routes is how any future expansion of the current light rail network might fit with it. If the new routes deliver on their promise of faster and better service systemwide, then perhaps we should rethink where new rail lines might go to ensure we get the most out of them and not be redundant. The new #7 bus line on Richmond, which goes to the Eastwood Transit Center, will be one of the high-frequency routes. Will it be good enough to undercut the case for the Universities Line? Maybe, but even if the buses run every ten minutes at peak times, they’re still going to crawl along in the traffic morass that is Richmond Avenue. Light rail, with its dedicated right of way, should easily beat its travel times. Still, that’s a point I expect the light rail critics of the future to haul out someday, once they remember they’re supposed to be pro-bus and they notice there’s better bus service available now. I still think an Inner Katy line connecting downtown to the Galleria via the Uptown BRT would have a lot of value, especially as a continuation of either the Harrisburg or Southeast lines. I also think the US90 extension into Fort Bend, hopefully all the way to Sugar Land if the politics can be worked out, should be a high priority. Beyond that, who knows? The point is that the whole system continues to evolve, and we ought to evolve our thinking along with it. The need for rail transit in Houston is not going to go down anytime soon. Unfortunately, Culberson has won again. In a repeat of last year, Rep. John Culberson, R-Houston, and Rep. Ted Poe, R-Humble, took their dispute over the Metropolitan Transit Agency’s University Line to the floor of the House on Monday. Poe represents the area along Richmond east of Shepherd, where he says people want to build the rail line voters approved in 2003. He proposed stripping Culberson’s provision from the spending bill, calling it an “inappropriate overreach by the federal government” while conceding the line deeply divides the Houston area. Poe rejected arguments that the money would be wasted if Metro was eligible. Culberson strongly rebuked Poe’s attempt to remove the language, lashing into Metro’s past history and noting his constituents west of Richmond bitterly oppose the line. He said he will continue to oppose the line because it is a waste of money, and voters in 2003 never intended it to run down Richmond. See here and here for the background. Culberson’s making the same tiresome BS arguments he’s always made, and they’re no more true or worthy of respect than before. Richmond runs east-west, so I presume those “constituents west of Richmond” are the people of Afton Oaks, who succeeded in convincing Metro to reroute the line away from them back in 2005 or so and continue to be very sore winners about it. While I appreciate Rep. Poe’s arguments and his willingness to stand up to his colleague and partymate, I disagree that this “deeply divides” the area. The division comes from a fairly small group of extremely squeaky wheels that Culberson enables, many of whom are nowhere near the route that will still hopefully someday be built. I fear that the only way to get to that point will be for Rep. Culberson to no longer represent any part of the proposed Universities Line route. That day can’t come soon enough. In the meantime, at least this doesn’t affect any current funding needs for Metro. We need to work to ensure that it never does. The bill is expected to be up for discussion on the floor of the US House of Representatives on Monday, June 9th, 2014. See here for the background. It’s not the first time he’s tried this – the man is nothing if not maniacally obsessed. You should contact your member of Congress ASAP to ask him or her to oppose this harmful amendment. Remember that Culberson’s Republican colleague Ted Poe supports rail on Richmond because he actually listened to his constituents about it. Until that fine day comes when John Culberson is no longer in Congress, the best we can do is keep him from doing any further damage. And maybe he has, though it wasn’t going anywhere at this time anyway. Residents and business owners along Richmond Avenue are breathing a sigh of relief — at least for now — as U.S. Rep. John Culberson has had his way, quashing federal funding for light-rail along Richmond, west of Shepherd, and on Post Oak Boulevard north of Richmond. Rail proponents on the other hand will be disappointed to hear that Culberson succeeded in getting the key amendment tacked onto the transportation leg of the $1.1 trillion omnibus spending bill recently passed by the Senate. “I’m very proud to have been able to protect Richmond and Post Oak from being destroyed as Fannin and Main Street were destroyed,” Culberson told CultureMap following a fundraising luncheon at Tony’s, which not so coincidentally is located on Richmond. Culberson trumped METRO in his long-running feud with the local transportation agency. He has been threatening and attempting to get his law passed for several years. “It’s a permanent federal statutory law. So it’s a felony if any governmental entities attempt to spend any federal money to push rail on those routes,” he said. The water is muddy on the potential for future federal monies for rail along Richmond and Post Oak Boulevard. Culberson says the federal funding prohibition is permanent. “This is the end of all federal funding on Richmond,” he said. I’m pretty sure Culberson, who tried this trick before, does not have the power to tell future Congresses what they can and cannot do. Congress will pass other budget and appropriations bills after this one, so some pro-University Line member of Congress, like maybe Rep. Ted Poe, could get an amendment in there to undo what Culberson did. Doing something is certainly harder than stopping something that hasn’t been done, so Culberson has the advantage now, but it’s not the final word. Despite his protestations about the popularity of rail on Richmond, opposing its construction has not been an electoral winner in the precincts along the proposed line. Perhaps this will galvanize rail proponents and they will help defeat Culberson in an election; a future Republican primary is the more likely path for that, but anything could happen. Perhaps Metro and the other stakeholders will get tired of Culberson’s act and find their own funding. The options aren’t great, but they never have been. The point is that the fight isn’t over just because Culberson says it is. I suspect Culberson is peddling snake oil here, but let’s take him at his word for the sake of argument. Westpark only runs as far east as Kirby, and east of Shepherd you’re literally in people’s backyards. How do you connect the east end of the line at Montrose to the proposed Westpark part of it? That subject came up in 2006 and the non-Richmond options generated a lot of neighborhood opposition as well as some creative but impractically expensive solutions. Even if there is an affordable way to do this that the area residents would support, the simple fact remains that Richmond is where the people are, and Westpark isn’t. Getting to Richmond from Westpark or vice versa means walking under US59, which is not terribly appealing from a pedestrian perspective. Putting it another way, rail on Westpark will have lower ridership and thus be less useful. Why would we want to do that? If the choice truly is “Westpark” or nothing, then “Westpark” is better, warts and all. I see no harm in Gilbert Garcia giving Culberson a call and seeing if he’s willing to put some money where his big mouth is. I don’t think he means it, and even if he does I don’t think it’s the right answer, as I don’t think this fight is over. But let’s go ahead and find out, so we at least know what’s on the table. Link via Swamplot. Here’s the Chron story on Rep. Ted Poe’s surprising-to-me support of building the University Line. Rep. Ted Poe, R-Humble, whose district shifted earlier this year to include portions of the area where the planned University Line would run along Richmond Avenue, said door-to-door canvassing by his staffers as well as phone and online responses demonstrate his constituents support the line. In remarks Tuesday on the House floor, Poe said 604 respondents to a Facebook solicitation supported the rail line, compared to 340 opposed to it. Poe’s district includes Richmond from Main Street to Shepherd Drive. The alignment west of Shepherd lies within the district of Rep. John Culberson, R-Houston, one of the rail line’s most formidable and implacable foes. 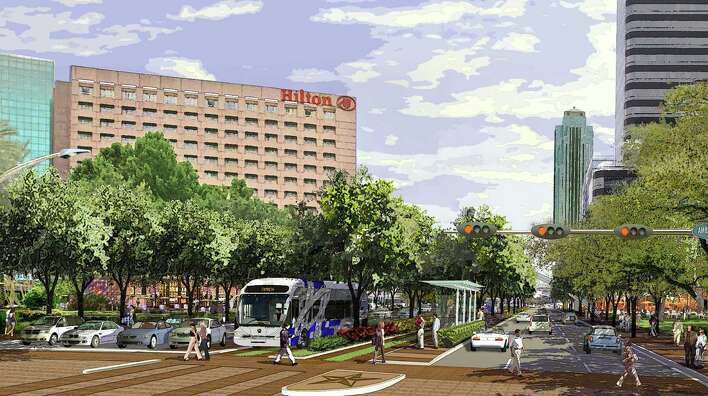 Though some early plans received a favorable environmental review by the Federal Transit Administration, Metro board chairman Gilbert Garcia said the agency’s priorities are focused now on opening the three lines under construction and developing bus rapid transit along Post Oak Boulevard. “We have our hands full,” Garcia said, noting that Metro isn’t seeking federal funds for the University Line at this time. Garcia said Poe’s encouragement left the door open to securing federal funds, although it might be years before Metro gets to the point of asking for them. See here for more. The good news is Rep. Poe’s sensible, constituent-responsive approach, which will be at least somewhat of a counterbalance to Rep. John Culberson’s fanatical opposition. Rep. Poe’s point that if we don’t take the money that we are eligible for someone else will get it is welcome. The bad news is that the most critical part of the University Line is still under Culberson’s thumb. Barring a court-ordered redraw of the Congressional boundaries that puts Culberson on the outside or an upset win over him by a rail supporter, the basic dynamic hasn’t changed much. Given that we’re not likely to turn our attention to the University Line for at least a few years anyway, perhaps this will give fate a chance to intervene in some way we don’t see coming. In the meantime, it’s a small but positive development, and I’ll take those where I can get them. He supports something, anyway, and that’s a step forward. Poe reports in the video that a majority of his constituents support the light rail line on Richmond. Click over to see the video. I am quite pleasantly surprised to hear this from Rep. Poe, and more than a little smug about the fact that the anti-rail fanatics were outvoted. They always were the minority, but effectively masked that by being loud. There’s a lesson in there for the rest of us. Anyway, I was set to publish a couple of the alerts I got about this, but clearly I wasn’t quick enough on the trigger. See below the fold for them; no point in ripping all that text out. Kudos to everyone who answered the call, and to Rep. Poe and his staff for genuinely listening.